National Acupuncture and Oriental Medicine Day is Oct. 24. Kristen Lum and other area practitioners are offering free or fee-based services and clinics. Dr. Kristen Lum, applies acupuncture to Ellen Shinkle on Thursday in her office at Rivergate Natural Healthcare. Acupuncture is one of several procedures that Kristen Lum offers at Rivergate Natural Healthcare. 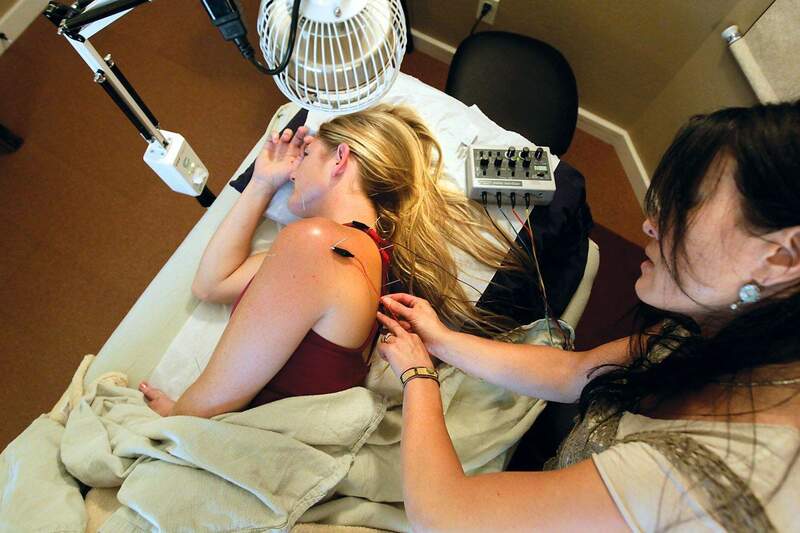 Dr. Kristen Lum, applies accupuncture to Ellen Shinkle on Thursday in her office at Rivergate Natural Healthcare. Acupuncture restores the flow of energy, says Kristen Lum, who applies acupuncture to Ellen Shinkle on Thursday in her office at Rivergate Natural Healthcare. A number of practitioners of Eastern medicine in Durango are offering free or fee-based classes and treatments to acquaint the public with their expertise on National Acupuncture and Oriental Medicine Day, Oct. 24. Were marking the transition into fall, National Oriental Medicine Day and the recent Chinese Moon Festival, said Oley Smith of Namaste Health Center. The Moon Festival is celebrated in the middle of the eighth month of the Chinese calendar  late September or early October in the Gregorian calendar. Oriental medicine includes a variety of procedures, including acupuncture, acupressure, Qigong, massage and herbal remedies to diagnose and treat health problems. But it isnt limited to practitioners of alternative medicine. Dr. Pakhi Chaudhuri, who has a medical degree, will use traditional acupuncture and shonishin and needleless acupuncture using flat pieces of metal in some cases. Kristen Lum at Rivergate Natural Healthcare, 3750 Main Ave., is offering four free 45-minute acupuncture and consultation sessions Oct. 24 starting at 2:30 p.m. on a first-come, first-served basis. Call 382-9100 for an appointment. Todd Flemion at Root and Branch Medicine will offer free group acupuncture from 8 a.m. to 1 p.m. and free classes on life-preservation exercises from 2 to 3 p.m. and health-related topics from 3:30 to 4:30 p.m.
Group acupuncture, Flemion said, involves treating several people at the same time as he has done in methadone clinics or when treating military veterans for post-traumatic stress disorder. The health-related class depends on topics suggested by the public, said Flemion, who can be reached at 426-2464. Our goal is to expose more people to Oriental medicine, Flemion said. Smith from Namaste Health Center is getting a jump on the observation by offering fee-based seminars Saturday and Sunday on nei yang gong, a form of Qigong, a discipline involving breathing and stretching that he calls Chinese yoga. Smith, a licensed acupuncturist and a certified Qigong instructor, can be reached at 247-2043. Durango city councilors are giving a nod to the observation with a proclamation awaiting council action Tuesday and the signature of Mayor Christina Rinderle.